Several months ago, I performed an annual exam on a lovely Chihuahua mix. This handsome boy let me look in his mouth, listen to his heart and feel his abdomen. Look at the picture below and then answer the following questions: What is wrong with this dog’s eyes? Does it affect his vision? List some of the common causes? Cataracts is the term used to describe cloudiness of the lens of the eye. When the condition is mild, the dog can still see through the lens although their vision is blurry. As the cataracts progress, less and less light is transmitted through the opaque lens resulting in blindness. 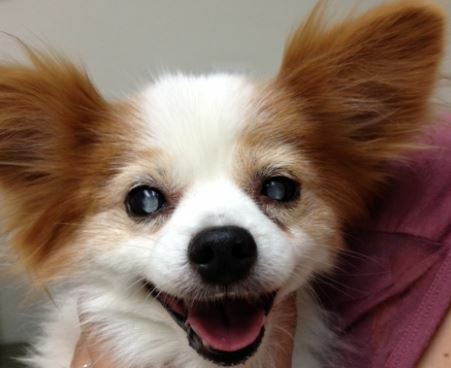 Unfortunately, this dog is functionally blind from the cataracts but his owner reports he gets around well at home. Since he developed cataracts, they have been careful to keep everything the same in their house. The two most common causes of cataracts I see in practice are inherited, even in mixed breeds like this one and diabetes mellitus.